The first film in the boxset is an Our Gang short from July of 1926. 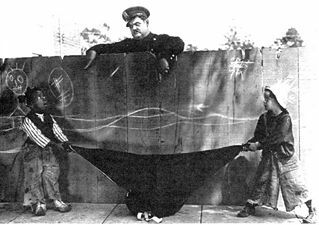 The first several films in the set predate the beginning of the true Laurel & Hardy partnership (that’s coming up in film #16, Putting Pants on Phillip), and this one doesn’t feature Stan Laurel at all. 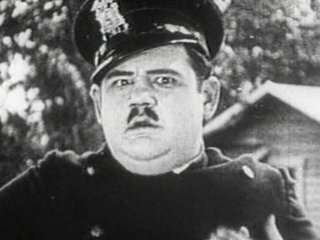 It’s included because Oliver Hardy has a small part as a cop. Hardy had a lot of roles like this, appearing in over 250 movies, before becoming a star. Unlike vaudeville and music hall veterans like Chaplin, Keaton or Laurel, Hardy wasn’t a trained comic actor. He was a movie fan who got into the business as a movie theatre worker (usher, projectionist, manager) then got a job as a grip and script clerk and eventually as an on-screen actor. He started at a small studio based in Jacksonville, Florida in 1913, at a time when Hollywood hadn’t quite yet established itself as the movie capital of the country. He later made films for studios in new York before moving to Los Angeles in 1917. After freelancing for a year, he spent 1918-1923 working for Vitagraph and began working for Hal Roach in 1924. Roach was one of the most successful comedy producers in history, producing films by Harold Lloyd, Our Gang, Charley Chase, Will Rogers and Harry Langdon, among others. It was at the Roach Studios that Laurel & Hardy became a team and they stayed there until 1940. All the films I’ll be covering in this set, as far as I can tell, were made at Roach. This Our Gang film is a good example of the kind of supporting roles Hardy would play before his breakthrough with Laurel. The plot involves the kids hanging out before a wedding, when one of them wanders off with his dog and watches a flea circus. The fleas jump on the dog and make their escape, causing itchiness in all the humans the kid and dog come across. Hardy plays a local cop who gets a flea infestation, takes his pants off to shake the fleas out then has his pants stolen. After painting his long underwear black, he chases down the kids to get his pants back. The fleas then invade the wedding and hilarity ensues. It’s totally silly and surprisingly charming, and it integrates animation pretty well with closeups of the fleas riding bicycles and wearing hats and such.